If you’re a current or past user of PaintShop Pro, you probably meet announcements of new versions of the software with mixed feelings. Sure, it’s always interesting to hear about new features and other improvements made to the program, but there’s always the worry that some tool you liked in the past will be removed or changed in a way you don’t like. Plus, it’s only natural to be concerned that major changes to the software will affect its performance or stability. 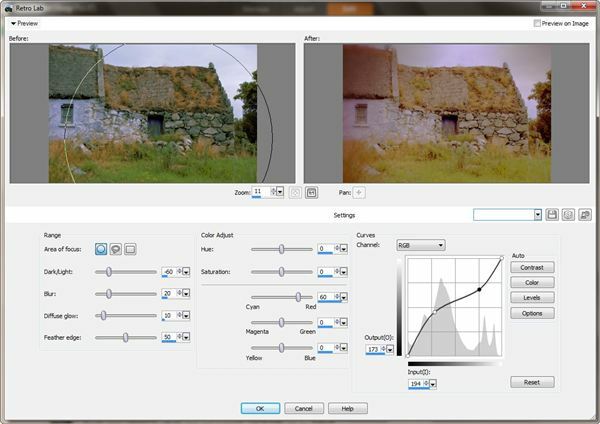 With PaintShop Pro X5, these potential concerns shouldn’t last for long. 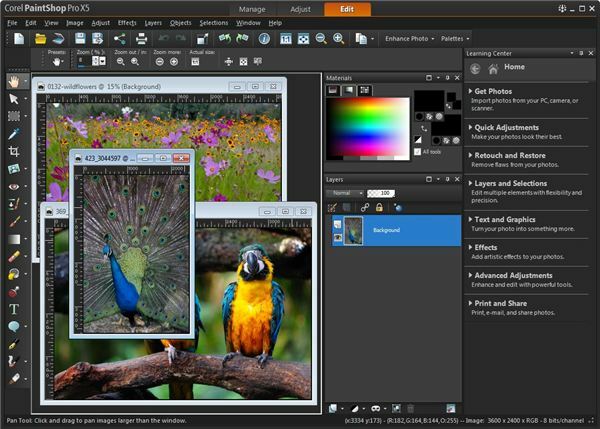 The new release has practically the same user interface as its predecessor – but if it’s been awhile since you upgraded, you may want to check out our older review of PaintShop Pro X4 to read about the major changes made to the interface in that edition. Additionally, I’ve found X5 to be extremely stable and to perform quite well. In fact, for the last week or so, I’ve kept the application continuously open on my desktop so I can pop over to it whenever I need to, and that hasn’t affected my system performance at all. Quite a few of the enhanced features in this latest version of PaintShop Pro are related to fine-tuning and stabilizing existing tools and capabilities, making them easier to use and less likely to cause frustration. For instance, have you ever spent several minutes selecting the perfect area of an image to crop and then lose that entire selection because of an accidental mouse click? Or, have you gotten stuck while using the text-editing tool and couldn’t figure out a way to get out? These issues and several others have been addressed in X5. Don’t worry, though – there are still quite a few new toys to play with in X5, too. We’ll take a look at some of those new features now. There was definitely a concentrated effort devoted to improving features related to sharing photos in X5. In addition to being able to upload your photos simultaneously to Facebook, Flickr and Google+, new integration with Google Maps lets you map your photos based on location information. 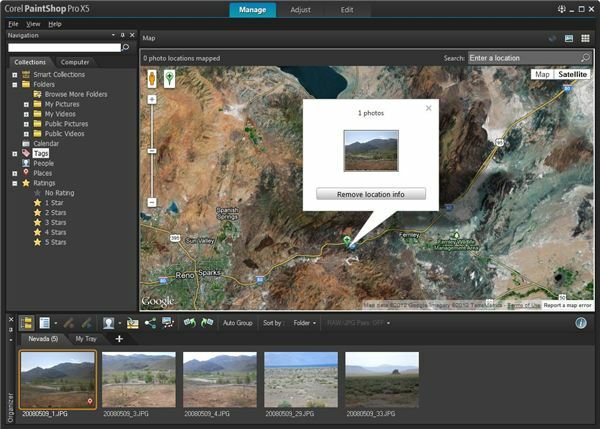 If a photo already has latitude and longitude values assigned to it, PSP can use these values to automatically map the picture – or you can manually assign a location to the photo. Along with these new mapping abilities, there’s also a cool new Share My Trip tool that lets you turn a photo collection into an interactive map, which can then be turned into a slideshow you can share via Facebook, Dropbox or on a blog. While the motivation for this feature is to make it fun and easy to share vacation photos, I can imagine lots of other creative uses for it. For instance, students might want to use it as part of a geography or history assignment or real estate agents may be able to use it to show current open listings. Then, of course, to keep up with other photo editing apps, PSP X5 also includes a facial recognition tool to make it easier to tag people in your pictures. If you like, you can even connect the software with your Facebook and Flickr accounts so that when you tag a person in PSP, those tags will translate to Facebook or Flickr tags when you upload the photo. 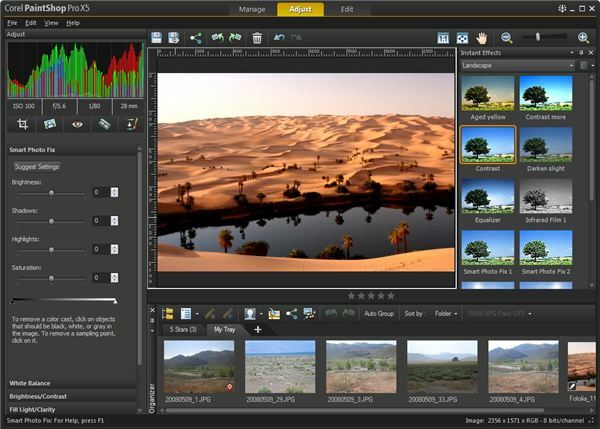 Several enhancements have been made to the collection of HDR tools in PSP X5, including an improved Exposure Merge which gives you more options and allows for greater control. 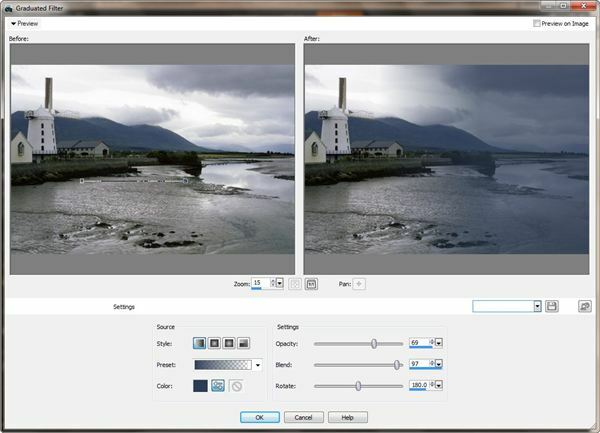 On top of these improvements, a new Single Raw Photo effect has been added. This feature allows you to simulate HDR processing by taking one individual photo and splitting it into three different exposures. You can then recombine the three exposures in various ways to achieve all sorts of effects. Creative types should have lots of fun playing around with this new capability. Whenever a new version of PaintShop Pro comes out, I always look forward to seeing the new creative effects more than anything else – and there are definitely some nice ones in X5. My favorite addition is the Graduated Filter effect, which lets you easily add a semi-transparent gradient to an image. Even though you could create this same type of effect manually using layers, selections and custom gradients in previous versions of the software, that method could be quite time-consuming. Now, with this new tool, it’s quick and easy. Another nice addition is the new Instant Effects palette, accessible in the Adjust workspace. If you like working in the Adjust space when making tweaks to settings like Brightness and Contrast, but hate going back and forth between the Adjust and Edit spaces to apply a simple default effect, you’ll love this feature. And, then, there’s the newly added Retro Lab, which opens the door to lots of creative opportunities. The Retro Lab is actually a collection of different effects that you can modify individually to come up with a filter that mimics a vintage style or some other look. There are several presets included with this tool – and, like with other filters, you can save any new collection of settings that you like to be used as a preset in the future. It’s quite a fun tool to play with – you could easily spend hours just experimenting with different settings. If you come up with some cool ones, please share! Like previous versions, PaintShop Pro X5 comes in two flavors – the standard and Ultimate versions. The standard edition has a suggested retail price of $79.99 with the upgrade option priced at $59.99. 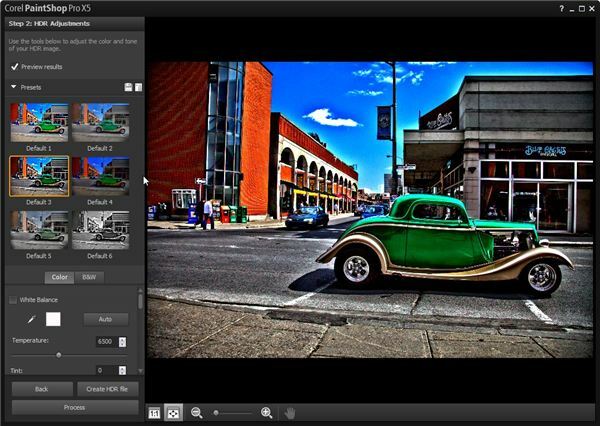 PaintShop Pro X5 Ultimate lists for $99.99, and the upgrade version is $79.99. Also, you can pick up the photo and video suite which bundles PSP X5 with VideoStudio Pro X5 for $129.99. While I believe there’s enough new stuff in X5 to warrant buying the upgrade, you might want to shop around and keep your eyes open for a couple of weeks. It’s pretty common for Corel to run a special introductory offer, so you may be able to pick up a copy of the software at a substantial discount. In the meantime, if you want to test it out yourself first, you can download a free trial from the Corel web site. Once you have tried it out, let us know what you think. I personally love X5, but I know things can vary from system to system – so your experiences may be able to help others. *Please note - the author received 'review copy of PaintShop Pro X5' from a company other than Bright Hub in order to develop the content contained within this article or review.